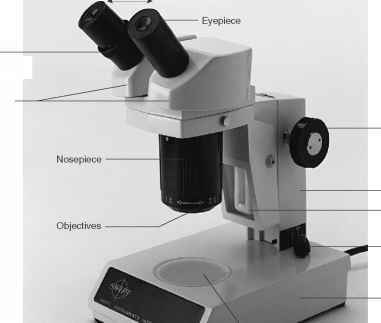 A stereomicroscope (dissecting microscope) (fig. 3.6) is useful for observing the details of relatively large, opaque specimens. Although this type of microscope achieves less magnification than a compound microscope, it has the advantage of producing a three-dimensional image rather than the flat, two-dimensional image of the compound microscope. In addition, the image produced by the stereomicroscope is positioned in the same manner as the specimen, rather than being reversed and inverted as it is by the compound microscope. If the instrument has more than one objective, change the magnification to higher power. Use the instrument to examine various small, opaque objects available in the laboratory. Figure 3.6 A stereomicroscope, which is also called a dissecting microscope.